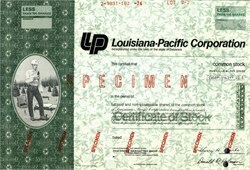 Beautifully engraved specimen certificate from the Louisiana Pacific Corporation printed in 1974. This historic document was printed by the American Banknote Company and has an ornate border with a vignette of a field engineer. This item has the printed signatures of the Company's officers. Louisiana-Pacific Corporation, commonly known as "LP", is a United States building materials manufacturer. It was founded in 1973 and is currently based in Nashville, Tennessee. LP pioneered the U.S. production of oriented strand board (OSB) panels. Today, LP is the world�s largest producer of OSB, and manufactures engineered wood building products. LP products are sold to builders and homeowners through building materials distributors and dealers and retail home centers.